Dear friends, on this holy day the whole of creation thrills with joy at the resurrection of Christ. With unshakeable hope let us pray for all things to be made new in him. 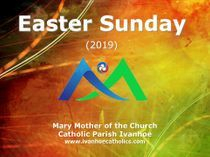 For the Universal Church, that together as one family, we may proclaim the saving joy of Easter. Risen Christ hear us. Lord, hear our prayer. For all who have been baptized this Easter and for all of us renewing our baptismal promises; may we share the joyous news of the resurrection with those we meet. For the Christian churches of the Holy Land and the Middle East, that they will hold fast to their ancient faith in the face of prejudice, hostility and discrimination. For the nations of this world, that the kingdom of the risen Lord may spread peace, justice and freedom. For all who at this festive time experience sickness, suffering, or tragedy. For the homeless, the refugee, and those who live without hope. For the recently deceased, and for those whose anniversary of death occurs around this time especially …. Together with all departed family and friends may they be awakened by the light of Christ and praise him forever. Holy God, source of all life and light, you have shown the power of your love by raising your Son from the dead. In your mercy draw the whole of creation into the glory of his victory over sin and death. We ask this through Christ our Lord. Amen.